Dubai International Airport, situated in the Al Garhoud district of Dubai, is operated by the Dubai Airports Company. Since January 2016, Dubai International Airport has over 7,700 weekly flights operated by 140 airlines to over 270 destinations. 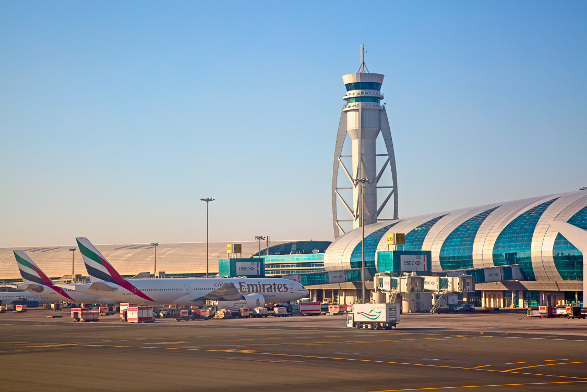 The airport is a key contributor to Dubai’s economy, employing around 90,000 people. Dubai International Airport (IATA code: DXB) is the third busiest airport in the world and the hub of Emirates and flydubai. Flights to Dubai International Airport are provided by international airlines such as Emirates, South African Airways and British Airways. DXB is a 12-minute drive from Dubai’s city centre. Book your cheap flights to and from Dubai International Airport online! Passengers can delight in the amazing shops at Dubai International Airport, where you can indulge in some much-needed retail therapy. A world of duty-free shopping awaits: shops at the airport include fragrances, jewellery, souvenirs, tobacco and fashion. Dubai International Airport has an exquisite range of delicious food and drink options. Grab a bite and drink at franchise outlets, coffee shops, restaurants and bakeries. The DXB’s international departures terminal has elegant lounges for travellers on Lufthansa, Emirates and British Airways. Dubai International Airport has a wide variety of amazing facilities, including prayer rooms, Wi-Fi, showers, a medical centre, baby care rooms and a business centre. Dubai International Hotel is located inside the Dubai International Airport. Guests can enjoy a cozy stay in a range of rooms or suites. Amenities include a swimming pool, jacuzzies, a business centre and meeting rooms. This 4-star hotel is a 4-minute drive from Dubai International Airport. Amenities include a 24-hour fitness centre, restaurants and bars, and a business centre. The Holiday Inn Express provides your vacation essentials, ensuring that you are comfortable at all times. It is a 2-minute drive from Dubai International Airport. Amenities include foreign exchange, a fitness centre, bars, restaurants and lounges. Travellers can purchase foreign exchange 60 days before departing South Africa. Travelex, UAE Exchange, ENBD Money Exchange, Sharaf Exchange and Dubai Express Exchange outlets are located at Dubai International Airport. Dubai International Airport is located 5 km east of Dubai’s city centre. Metered taxis, metro, bus, car hire, Uber and airport shuttle options are available to transport you to your destination.